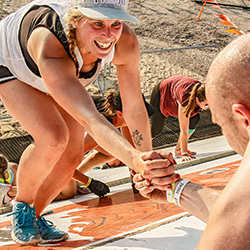 Tired of trying to convince your friends to run a Tough Mudder with you? 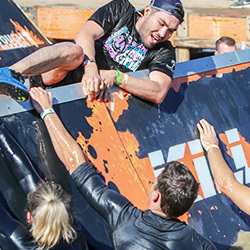 Want in on some course crushing Tough Mudder action but your usual squad can’t make it? We’ve got your back in 2019 with our all new Solo Runner Waves, made up of Mudders like you who are looking to team up, tackle the course, and forge a new team in the mud. You might come alone, but snag a spot in a Solo Runner Wave and you’ll be leaving with a massive new muddin’ crew. Once registered, navigate to My Active Events and select "Join Team". **Note team search is case sensitive. 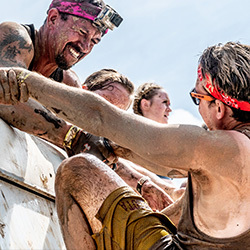 "I love the Mudder mindset that it’s a challenge, not a race. I met a new friend that day. We walked the event together, but it didn’t matter because we were there to be challenged and help each other out." "This was my 1st event, and found it to be fun as well as friendly. Helping people through some of the obstacles was a great way to making new friends."" 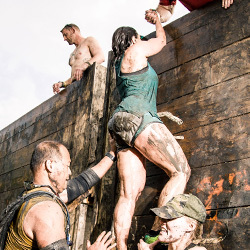 "I had so much fun doing the Tough Mudder with my family and friends. That's to mention all the new friends I made throughout the course. I may have been physically exhausted when I crossed the finish line, but I was filled up and inspired by all of the effort everyone put into helping others succeed and overcome things they didn't think was possible." "It’s a wonderful challenging time that you get to experience with people you know and complete strangers. I love how everyone is willing to work together, cheer and support others. So much fun and very challenging!"